(Jakarta, 3rd December 2013) – Welcome back the annual Aston Fair trade show was held on Friday 29th November. This tourism event brings together representatives of more than 60 Aston managed Hotels as well as East Java’s Travel Trade and Media Communities. Each year at the Fair, Archipelago International takes the opportunity to announce the group's future development plans, as well as recapping recent successes and company milestones. This year, Archipelago International will announce the opening of another 5 hotels by December, making the total number of hotels in operation 75. They will also reveal plans to open another 30 hotels in 2014, reaching a total of 100 hotels in inventory. The new openings will be in Jakarta, Bandung, Surabaya, Madiun, Bojonegoro, Solo, Malang, Yogyakarta, Bali, Balikpapan, Banjarmasin, Lombok and Kupang. Furthermore and following this year's launch of The Alana and Harper hotel brands, Aston Fair spectators will also gain insight into the developmental progress of these two new chains. The Alana brand is Archipelago's latest upscale designer lifestyle hotel label. In Hawaiian, Alana means “fair, beautiful or offering”. Alana Hotel & Resorts aims to be truthful to this name, offering high end lifestyle boutique hotels that are sophisticated yet friendly and welcoming. Alana Hotels cater to travelers who appreciate style, personalized service and a stimulating environment. They set themselves apart by presenting an extra dimension of escapism, namely the chance to experience - however briefly - a lifestyle that is glamorous, fashionable and exclusive. The first property to open was The Alana Surabaya, while the next projects are in Yogyakarta, Jakarta, Sentul and Bogor. Meanwhile, Harper brand presents its 3 and 4-star newly built hotels that hold 100 to 250 rooms in city and resort locations. Rooms are a minimum bay size of 28sqm and a maximum of 40sqm, while suites will be 1.5 times the bay size. City location HARPER Hotels will feature executive floors with club lounges and ladies-only rooms, while all HARPERS will offer the brand's proprietary destination restaurant concept, “Rustik Bistro & Bar”. As its name implies, this signature eatery serves up home comfort food paired with great wine and cocktails in a fresh, light and elegant space. The first Harper to open was Harper Kuta in Bali, with following projects hitting Yogyakarta, Banjarmasin, Bandung, Puncak and Bogor. 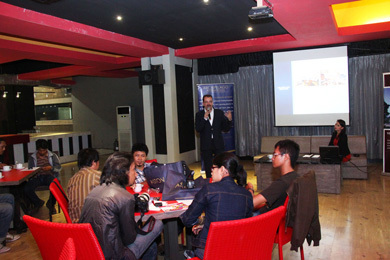 Snapshot of Aston Fair Surabaya 2013 Press Conference, seen in the picture - Mr Norbert Vas, Vice President Sales & Marketing Archipelago International presenting the latest Archipelago International’s new project and 2014 Business Development. 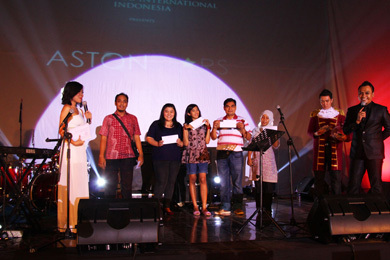 Snapshot of Aston Fair Surabaya 2013, seen in the picture - Aston Fair 2013 Door Prize Winners.